Yesterday I met a nice guy who was actively trying to build a network of professional contacts. This guy was a professional who knew his industry and had realized that to advance in his firm he would need to be a "rainmaker" and bring in his own clients. He was excited about building a book of business, but wanted to find a way to get fast results. 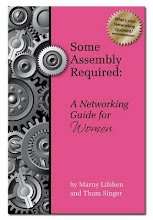 There are no quick fixes to building a network and turning those connections into real business opportunities. We all remember the story of the Tortoise and the Hair. Slow and steady wins the race. No matter what your career goals, you will most likely not achieve them as fast as you would like. Most overnight successes spent years doing the necessary basics, which set them up for great achievements. When they finally are on "top"....others will refer to them as "lucky" or "fortunate". In most cases they were neither. In most cases they made good choices along the way and just kept inching along toward their goals. Successful professionals still have many days where they feel they are stuck in a rut or just not achieving. Everyone has bad days. But the best of us get past these "feelings" and just get back to work. I had one of those days last week. I was trying to set up some sales appointments and just not having any luck. It "felt" useless. I struggled. I considered going home early. Like the turtle racing the rabbit...I want results fast and I want victory to come easily. Instead I decided to make five more calls. Like the turtle, I just moved forward one step at a time. On the third call I set an appointment with a great prospect. If I had stopped, I may have never made that connection. How about you? What could you do right now to help advance you cause. Close the internet and go do it right now. 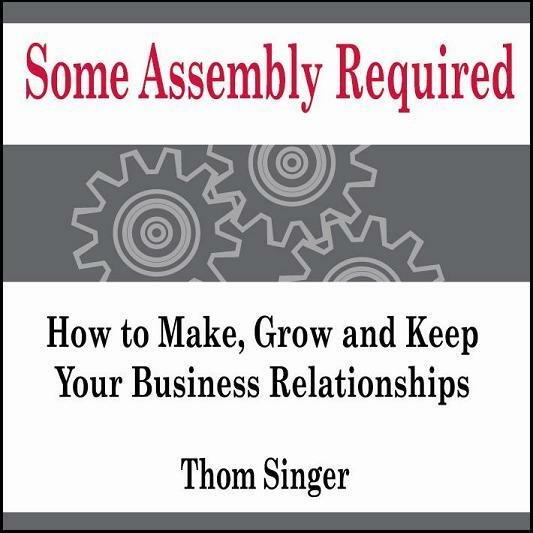 New Year Publishing is proud to announce the release of "Some Assembly Required" as an Audio CD. 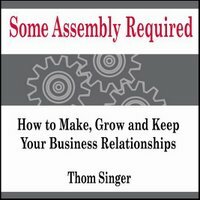 Available now at www.thomsinger.com (and soon to be at Book People in Austin, Texas) for $19.95. Thank you to everyone who made the Audio Book a reality!! Now you don't have to read books to receive the message of the book. Enjoy!!! Guy Kawasaki has a great book review on his blog (his blog is a "must read") highlighting a book that looks very interesting: "What Would Jackie Do?--An Inspired Guide to Distinctive Living". The book is a how to guide to behaving with "grace and class" in all situations... using real life examples from the life of First Lady Jacqueline Kennedy Onasis. Some people have never been taught the importance of behaving properly. This is especially evident in the new world of anonymity that is provided in cyberspace and the blogosphere. I am amazed at the mean-spirited comments that are often posted on blogs when someone disagrees with the author. Usually these commenters do not post their names, but rather shout horrible words and threats while hiding behind their computer. In a real life social interactions most people do not randomly insult strangers (think about going to a corporate networking event, not many people are called "jackass" during cocktails!!!). However, online many feel the freedom to attack others. Online communities will can never achieve their hopes and dreams of being relevant "networks" unless those who participate in them are held to the same socially accepted standards of the real world. Thanks, Guy, for a great post. I look forward to reading this book. Are You A Technology Leader? Every two years the leaders in the world of technology gather to discuss the important issues that cross country boarders and effect the future of everyone on the planet. This year's conference will be held in one of America's premier tech centers: Austin, Texas. (The next one will be in Malaysia, so don't wait for 2008 if you live closer to Texas than Asia). The information, knowledge exchanged and the networking is like nothing else on the planet. This May, leaders from business, government, and academia will convene at the 15th World Congress on Information Technology to assess the impact of ICT on the global community. As a catalyst for social and economic development through the exchange of policies, ideas, and technology, WCIT 2006 stands alone as the world's premiere Information Technology (IT) forum. 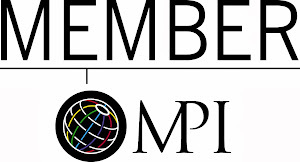 The biennial conference is expected to draw 2,000 business, government, and academic leaders from 80 countries. This 15th World Congress seeks to explore issues of impact and create actionable policy recommendations to world and technology industry leaders focusing on three issues of Global Impact: privacy and security, healthcare, and global digital access. Attending a forum of this caliber is more than a perk...It's your job! And it is about the future. For anyone who is anyone is the world of technology, this conference will bring together leaders, innovation and ideas. When a perfect storm like that comes together, powerful ideas develop. And that leads to the creation of more technology, commerce, capital and careers. In addition, The city of Austin and Cisco Systems are creating a high-speed wireless network that will deliver free broadband internet access to parts of downtown Austin, East Austin and Zilker Park. This free internet connectivity will allow the delegates to the WCIT to have online access throughout their stay at the conference, and the network will remain active after the May gathering, leaving Austin, Texas with the best high-speed free internet access in the world. 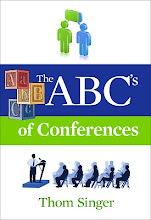 Pass along the link to this conference to any tech leader you know: www.wcit2006.com. 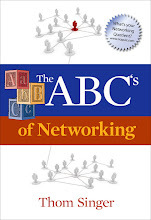 The successful book by Keith Ferrazzi titled "Never Eat Alone" is a runaway best-seller on the topic of business networking and building relationships (I only wish my book on the same topic had sold half as many copies...although it continues to sell well!). While I agree with everything Mr. Ferrazzi says, today I had a nice experience which de-bunks the "never" part of his title...... Sometimes you should eat alone!!! I schedule business lunches most every day. If I am not eating with a client or a referral source, I am dining with co-workers or other friends. Since you have to eat anyway, this is a great way to make connections, cultivate business relationships or just stay in touch. Today, however, I had a last minute cancellation for lunch. Since I was busy in the office, I gratefully accepted the extra time to catch up on emails and phone calls during the lunch hour. Usually with no lunch appointment I will grab a sandwich from the local deli and eat at my desk. But my canceled lunch was to be held at my favorite downtown Mexican cantina...and the thought of that great cuisine just kept calling to me. By 1:15 PM I was starving and I had to have the taco plate. So I decided to go to the restaurant by myself, "table for one". With the hectic lives that most business professionals live, I was reminded that on occasion you have to just stop and take a few minutes out of your routine and enjoy some alone time. Many people work ten (-plus-) hour days that include breakfast meetings, lunches, cocktails, dinners, etc.. It seems that every free minute away from the desk is spent with a scheduled activity. Twenty-five years ago they were worried that technology was going to free up so much time that the average 40-hour per week American worker would only have a three day work week. HA HA !!! That didn't happen. It seems that technology has imprisoned the American worker into a 50 to 60-hour work week with no time to smell the roses. But today I spent 30 minutes with nothing to do but enjoy some great Mexican food. I did not bring my laptop, customer files or a newspaper. I just sat alone and ate. So no matter how dedicated you are to networking....SOMETIMES EAT ALONE!!! I failed to notice that March marks the one year anniversary of this blog. Amazing. I began this as an experiment, and now it has a life of it's own. I logged onto to blogger.com in early March 2005 after attending a luncheon that talked about blogging. The speaker said it was easy to begin, so I gave it a try. Thank you to everyone who reads what I write, and to all those who have bought my book, posted comments and sent me emails. We've come a long way. Here are the archives from last March. Enjoy. If you live in Austin, Texas - Mark you calendars for a special event where I have been asked to speak on a panel about networking skills. 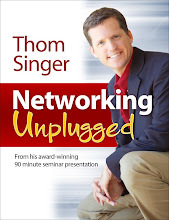 I will be on a panel discussion on the "Art of Building Your Network" along with my good friend Scott Ingram from NetworkInAustin.com. The cost of the event is $25 for Chamber members and $40 for "future" Chamber members. Yesterday I wrote about how a restaurant owner turned a Saturday lunch into a wonderful experience. He did not just do this by providing the service I went into purchase. I went to his restaurant to get lunch with my family. We could have eaten lunch at any of the hundreds of restaurants that litter the roadside, and received the nutrition to carry on through the day. What made this restaurant so special was that the owner and the staff went the extra mile to make us feel welcome. Think about your business. The product or service that you offer is just part of the equation. If you think that you are such a great lawyer that your skills are all that matter, you are mistaken. If you think being an accountant with Sarbanes-Oxley knowledge is all the clients cares about, you are not seeing the whole picture. If you are a banker who thinks the lowest interest rate is all that counts, you will be left in your competitors dust. Delivering a quality product at a good price is only the start. In today's business environment quality and value are just the start. Everyone claims quality. (Most actually have it!!). You need to do more to reach your customer at their heart and solidify their impression of you as more than just a commodity. Too many professionals get confused on this issue. Their egos let them believe they are superior to their competiton, and thus they think they will automatically succeed. Many talented businessmen continue to leave money on the table because they do not take the time to amaze their customers. They just provide the product or service, and then bill the client. They add no personal touch, and thus they do not turn their clients into "fans". Think about sports....anyone can go to a game....but fans go back time and time again. As the first quarter of 2006 comes to an end the time has come for you to review your "Customer Touch Points". Since you mailed that Christmas Card in December....what else have you done to show them that you care about more than just their paid invoice? You can do many things to tell people that they are an important part of your business. To do nothing leaves them vulnerable to your competition. Think about that for a few minutes. What if your client feels that the competition cares more about them than you do? What do you think will happen???? Stop sitting there. Appreciate your clients or prepare to say good-bye. Word of Mouth Marketing and Buzz Marketing are all the rage in 2006. You can barely pick up a marketing publication or surf blogs without seeing the topic displayed, dissected and discussed. Buzz is all the buzz. But there is no trick to getting you and your company on the tip of everyone's tongues. 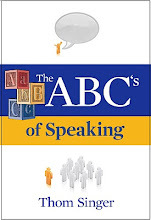 To get your customers to sing your praises from every mountain you must be simply spectacular. You must stand out from the competition, and do so with gusto. I was reminded of this over the weekend while vacationing on Galveston Island (on the Gulf Coast of Texas). I had never been to Galveston, and I had heard mixed things about it as a family get-away destination....but my family had a great time. While many things contributed to the experience, the highlight of the weekend was the lunch we ate at the Mosquito Cafe. Galveston is not lacking for restaurants. It seems that most of the usual suspects chains are present along the Sea Wall, but the Mosquito Cafe was off the beaten path. We discovered it quite by accident, and decided it looked inviting. I could rave about the food for paragraphs (but I must mention the "Lemonade Dream Cake", which is the best piece of cake I have EVER tasted. I now feel sad for all other cake), but it was not just the amazing cuisine that made this place special. It was the owner and his staff that set this restaurant apart from the hundreds of others. The owner, Stephen Rennick, walked around the restaurant visiting with all the patrons. It was clear to any observer than this place was a favorite of the locals on the island, and not just a tourist destination. He assisted his wait staff, and still found time to talk to the guests. He spent ten minutes with us, answering our questions about the restaurant, his background, and the other great places to eat in Galveston. While he would not share the recipe for the cake (DANG), he did make an impression on my family. Even my nine-year-old daughter noticed that he was "nicer than most restaurant owners" (not that she has ever seen any others come by the table and socialize...that just does not happen everyday). When we left he gave my wife an extra piece of the lemon cake, and two homemade cookies for my kids. This little bit extra just made it official....this guy and his restaurant are fantastic. There was always a crowd waiting to get into the restaurant (both while we ate and when we drove past the night before). Without a doubt, this establishment has "Buzz" and the "Word of Mouth" is working. I could not wait to write about this restaurant on my blog, as everyone should know about greatness when it exists (it is so rare these days). If your travels ever bring you to Galveston, you MUST eat at the Mosquito Cafe!!! You wont be disappointed. As a kid, St. Patrick's Day was always one of my favorite days of the year. And this began long before I could drink the green beer!! You see, my mother's parents were both born on the Emerald Island (aka: Ireland), so our family was all about celebrating this special day. I fondly remember my aunt Catherine's famous Irish Soda Bread (the recipe has been published in my wife's cookbook, Mad At Martha, with Catherine's approval...so now you too can enjoy this amazing treat) and corned beef with cabbage. And God forbid one did not wear the green on St Patrick's Day!!! Pinch, pinch...OUCH. In addition, my mother always made this an extra special day for me, as my middle name is Patrick. She even died part of my hair green for the day when I was in kindergarten (fortunately, not a tradition that stuck). Anyway.....you don't need to be Irish and have a stripe of green in your hair to have the luck of the Irish on this day. So enjoy the spirit of the Irish today and have fun. So "Top O The Morning" to you and yours. And "may you be in heaven a half hour before the devil knows you're dead!!!" (My favorite Irish proverb). You don't have to take yourself so seriously. Last night I had the pleasure of drinking wine and playing dice with a top executive of a major company, who has a life that most people dream about. He is a "Captain of Industry"
Yes, he has a lot of fun. I am not sure I have ever met anyone in my business career who enjoys life so much, and engulfs others in his circle of joy. In two hours I learned more about success than I have learned in a dozen years. This person spent the evening with a group of people he did not personally know, and yet he dedicated 100% of his attention to those around him. I wont name him by name, but he is known as a maverick in his company and industry. He could have easily been acted as if he was above those around him, but instead.....he was just the opposite. He was just cool. Comfortable. Delightful. I thought a lot about this guy who could be equally at home in jeans and sandals as he would be in an expensive Italian suit. I wish more people in the business world like this man. Why do so many people get caught up in image and delusions of self importance? How about you? Are you the cool cat to hang out with? Have you even considered how you act around other people? Does your success define who you are....OR... are you defined by something greater than the size of your paycheck? I doubt I will encounter this gentleman again, but I will not forget the lesson I learned last night. Be yourself. Have fun. Talk to everyone. Laugh. Make others feel important. And pick up the check!!! Need some help? Just ask. 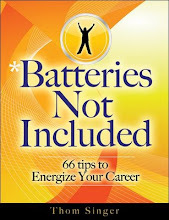 I am amazed at how many people know that they need assistance from co-workers to reach their potential, but fail to ask. I guess people would rather simmer in mediocrity than appear to look weak. (Guess what, asking for help is rarely seen as weakness.....failing to excel is however). I am equally amazed at how many professionals never ask prospects for their business. They meet with them, pitch their product or service and wait. And wait. And wait. And then wait some more. Part of selling is closing the business. You will never win if you do not close. Making the prospect make a decision (hopefully "yes") will usually only happen if you are the one who instigates bringing the sales cycle to a conclusion. I once sold print advertising, and the greatest part was that we had a press deadline. From the first day I would meet with a potential customer we both knew they had to decide by press time. It made forcing a decision much easier. Not all businesses have hard deadlines. Hiring a new law firm, bank or consultant may or may not be tied to a specific date. Thus if you do not ask for the business, the prospect has no compelling reason to take action. And there is no bad answer. If they say "yes"...well, CONGRATULATIONS!...you got a new client. If they say "no" that just means "not this time"....so, Congratulations, you know that this company is not buying today (so you can focus you attention on another company). And, they become a prospect for next time. Sometimes it takes years to win the business. If they say "no", do not write them off. Stay in touch with them. Be tenacious. I challenge you...find three things to ask for before Friday. Ask co-workers for help, ask clients for referrals, and asks prospects to give you their business. 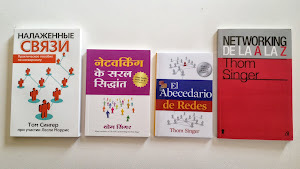 I am on a roll for reading great books. Yes, they are not business themed tomes, but none the less, all work and no play makes Jack a dull boy. You gotta have some fun, too. Last week I wrote about Mike Greenberg's "Why My Wife Thinks I'm An Idiot". I actually wrote my review while only 1/3 into the book. You will be thrilled to know that the rest of the book was equally as entertaining. This weekend I read (and finished) another ridiculously amusing book by A.J. Jacobs. His book, "The Know-It-All: One Man's Humble Quest To Become The Smartest Person In The World" is more that great. I loved this book. I wish I could sit down and eat dinner at some New York City diner with this guy. If you do not usually read humor books, break that tradition and join A.J. for his adventure of reading the entire Encyclopedia Britannica. Yes, that is what he did. It took him more than a year (and most of his wife's pregnancy) to complete this task. 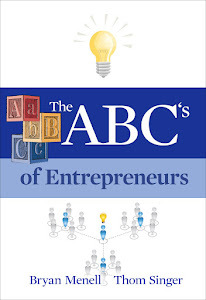 The book takes you through the journey of this thirty-something's battle to gain knowledge. I really liked everything about this guy and his book. Maybe I felt a kinship with him because of his stint on the TV Game Show "Who Wants To Be A Millionaire" (althougth I out-earned him with my two gameshow appearances by over twenty times!!!). Treat yourself to one of the most pleasurable books you will ever read!!! If it is Friday, it must be time to answer a question. "I am in marketing/business development for a small law firm. They will not give me business cards because I am considered "staff". What should I do?" I cannot believe that in 2006 law firms still exist that think that staff should not have business cards. Everyone who works for the firm should be issued business cards. ESPECIALLY the marketing department. (The receptionist and the people in the mail room, too!!!). By not providing business cards the lawyers are sending a message that says; "we are superior and the only ones who matter". What do they think these card-less staff says when asked for a card by people they meet? They say; "I am just staff and the firm does not give cards to staff". This is heard by the outside world as; "I work for pompous jerks". Any lawyer who reads this blog whose marketeers, secretaries, recruiters, IT staff, etc... do not have business cards....RUN, do not walk to the printer and remedy this situation. If you think it costs too much money, you are nuts. Every person on your staff should be seen as part of your marketing team. If they do not have a card, they cannot promote your firm. 250 cards cost around ten or fifteen dollars. If for no other reason, it will make your team feel good. Professional business people are issued business cards. Treat your staff like professionals and you will get professional results. To NOT give cards says "YOU ARE NOT PROFESSIONAL". Lawyers cannot succeed without staff, so why would you treat them poorly? Can you tell this question has me upset? It does. It is an attitude like this that is the reason firms fail to succeed in their business development and marketing endeavors. My guess is that firms with attitudes like this will wallow in mediocrity for a long long time.....never understanding why they cannot do better. I challenge every lawyer (or any professional) who does not issue business cards to staff to either change that policy today or to post a response here explaining why you will not alter your opinion. My suggestion is to do what the best people always do....go find a new job where they appreciate you!!! The White Paper That Is Not On White Paper!!! In the year 2006 everyone actively uses the internet to market. All firms large and small have successful web strategies to promote their business, yes? Busy professionals are versed in blogs, SEO, podcasting, and streaming video, Right? Some would think that knowledge of all the ways to maximize on-line activities is pervasive by now. One might think so, but it is not true. The use of the internet for marketing is still in its early stages (I know, the dot-com boom seems like a lifetime ago...but it was just yesterday). If you are not 100% sure of every way to promote your practice on the internet, you need to read the informative new white paper (that is in full color...not just on "white paper") recently released by Mark Merenda. Merenda is the founder of Smart Marketing, a premier national marketing firm that specializes in the legal and financial services industries. The free white paper, Using The Internet To Market Your Law Practice makes the confusing on-line world easier to navigate. While large firms have whole departments dedicated to assisting professionals, small firms and independents can often feel very alone in these uncharted waters. His twenty-five page paper is easy to read and covers the topics of websites, search engines, pay per click, blogging, podcasting, e-newsletters and streaming video. If you feel that you are behind your competition with your on-line marketing strategy, don't just sit there. The longer you wait to understand the internet, the harder it will be to catch up. If your firm is still holding on the the hope that the web is just a fad.....it is time to log on and smell the coffee. Mark will happily provide you with a free copy of this wonderful "white paper" if you email him at mark@smartmarketingnow.com. I was in the bookstore on Sunday looking for a new book. I don't know why, since I have three or four books on deck, waiting for me to read them. I often can browse the business and non-fiction section for hours before a book leaps out at me. This day was different. The title grabbed me within seconds and I could not put it down. 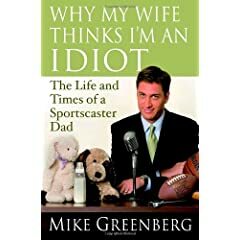 Why My Wife Thinks I Am An Idiot, by Mike Greenberg. First, I am not a big sports fan. I like to go to a game (any game) with a group of friends and be part of the experience (and drink a large beer or four from plastic cups)...but I am not the guy who follows teams and players. I rarely listen to sports radio/TV. So with that in mind, realize that I have no idea about Mike Greenberg. Turns out, he is a sports radio and TV personality who has a top rated morning talk show and is a fixture on ESPN. But as a husband and father of two daughters (age 8 and 4) I was drawn to the book like a bug to a porch light. I too am sure my wife thinks I am an idiot....although she continues to seem to like having me around. I am only 75 pages into the book (The book I wrote is only 100 pages long).....but I cannot wait until I get a chance to read more. I am already thinking about who I will give copies to (as my friend's wives think they are idiots too). Anyway, I know that to create such a thing like a book takes effort, and I believe when someone writes one that is this entertaining, you should say "Good Job". So I decided not to wait until I finished reading the book to praise it in my blog. I can already tell that it will be one of my favorite reads of 2006. Friday night I attended a wonderful event in here in Austin, Texas. For nearly ten years the Young Men's Business League and the Young Women's Alliance have sponsored the Austin Under 40 Awards, and this year's gala awards ceremony was one of the best ever. In a city where youth, health and fitness, community service and the entrepreneurial spirit are celebrated... The Austin Under 40 Awards are an important community event that honors local business leaders in ten categories who donate their time to making Austin a better place to live and work. *Also named "Austinite of the Year"
Matt Diamond - Dell, Inc.
All the winners exemplify excellence in their careers and service to the community. I am proud to know many of these fine people and to call them my friends. Proceeds from the gala and the silent auction benefit the Austin Sunshine Camps and the Young Women's Alliance Foundation. Congratulations to all the Austin Under 40 winners!!! On Fridays I answer questions about networking, sales, business development, marketing or PR that I hear during the week. 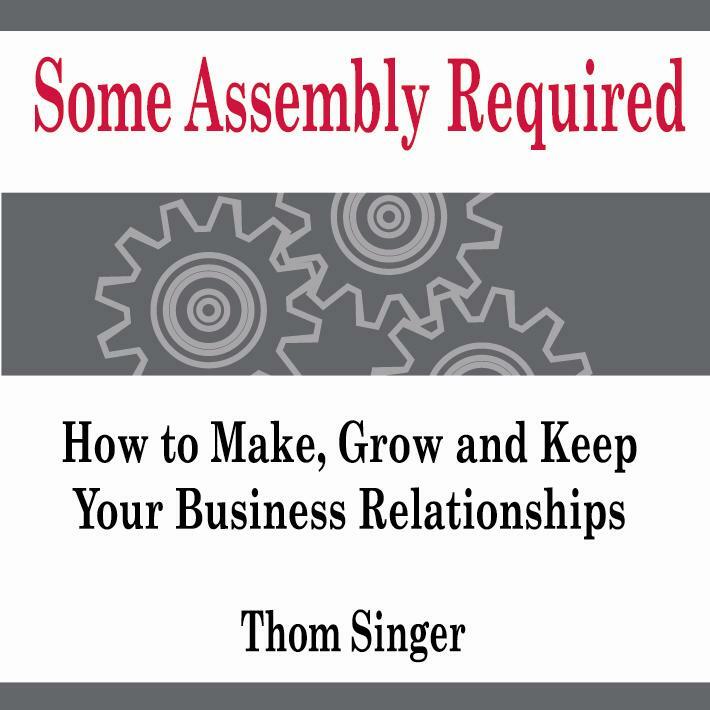 "How do you repair a business relationship that has gotten off to a bad start, or has been damaged?" Often times when we are dealing with people we might get off to rocky start or have an incident that causes the relationship to go south. The best way to handle this is to address the problem in a fast and straight-forward manner. Approach the other person and directly discuss the negative situation. If you are at fault (even partially), then apologize. If it is not your fault, but the other person's perception is that you are at fault, then admit to a misunderstanding, and apologize for your part in the mis-communication. Some people are petty and will never give you a second chance. These people are rare. Most will accept your attempt to remedy the situation. If they will not, then you are better off without them. Still be polite when you see them, but realize that people like that are small-minded and move on. Don't waste your energy on people who are above accepting an apology. 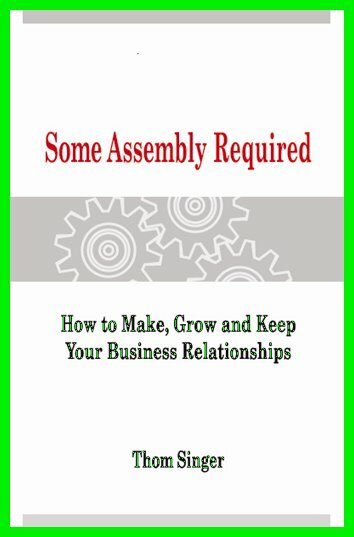 If you are able to repair a business relationship, you must pay special attention to make sure that you are careful not let there be any other problems. Most people will forgive you once, but the smart ones will never forgive you twice. David Lorenzo at The Career Intensity Blog has some good advice called "Three Pointers For Any Career". Read the whole post and many of his others (his blog has become one of my favorites, and I look forward to reading his soon to be released book). 1. Make smart, bold decisions. It is simple, but if you approach your job with gusto and take actions that are not always the easiest course....you will achieve more. Meanwhile, you cannot be so set in your ways that you cannot see when you are on the wrong path. Situations change, if you don't change with them you will get lost. And finally, you cannot do it alone. You need others to give you a hand up from time to time. If you regularly step on people, there will be a time when they will return the favor. Always, always, always treat others with respect.